Background: Aim of the study was to evaluate the direct association between the bacterial load on surgical instruments and the time of holding before the disinfection procedure and further Comparison of disinfecting efficacy of glutaraldehyde, hydrogen peroxide (H2O2) and ethyl alcohol on contaminated surgical instruments. Method: Out of the total of 120 pairs, 60 pairs were of tissue forceps and 60 pairs of DeBakey forceps were evaluated in this study. The four different inocula were prepared in the two different medium. The inocula of 5 × 103 CFU/ml of Staphylococcus aureus, Pseudomonas aeruginosa and E. coli were prepared on the sheep blood agar and the inocula of Bacillus subtilis and their spores were prepared on the tripticase soy agar plates. Number of colonies were calculated and further compared with the initial time i.e. the time zero after the incubation. The pre-disinfection count of microorganisms were calculated and compared with post disinfection microbial count in each and every group. To elicit the growth of micro -organisms, nutrient agar was taken as a medium. Results: In the first 6 h, the bacterial load did not showed any changes. It was absolutely the same as it was before the 6 h. However, after the passage of 6 h, the bacterial load started increasing suddenly. Conclusion: We conclude our study that it should be mandatory to clean the surgical stainless steel instruments during the first 6 h after the surgery, so that the accurate and effective serialization of instrument can be achieved. Serialization, Micro-organism, Holding time, Stainless steel surgical instruments. Surgical instruments and medical devices that are exposed to areas of the body that are normally sterile are recommended to be sterilized between uses. If we will use the contaminated surgical instruments, this will result in further severe infection. The instruments that are heat resistant, has been sterilized by the method of steam serialization or by the autoclaving procedure. Those instruments that considered to be heat sensitive has been sterilized by the chemical disinfection procedure. The chemical disinfectants provide lower level of safety as compared to the heat serialization procedure, so they are not considered to be the safe procedure in the serialization of surgical instruments. The level of microbial contamination of the object to be sterilized plays a critical role in determining the efficacy of the sterilization process . Studies concluded that though, with the use of chemical disinfectants there is reduction in total viable count of microorganisms. But, none of the chemical disinfectant is able to remove 100% of the microorganisms. So, defiantly there will be some chances of cross infection even after the disinfection with the chemical disinfectants as even a minute percentage of microorganisms can cause cross infection. So, the serialization will be more reliable process as compared to the disinfection . After the surgical procedure, the surgical instruments supposed to be contaminated with the microorganisms upto the certain level. The literature suggests that the bacterial load on the instruments depends on the type of forceps and the anatomical site. The amount and the number of the microorganisms present on the used instrument will determine the time period of the sterilization or the disinfection . It means to say that how much time of sterilization process has been required to kill the micro-organisnsms. The very less literature and data has been described till now regarding the accurate level and type of contamination of the surgical instruments is very limited . The previous literature revealed that the stainless steel surgical instruments in the departments of central sterile supply having relatively a very high incidence of bacterial load [5,6]. The research does not validate that the instruments were contaminated only through the intra-operative procedures because there will be some chances of postoperative contamination outside of the surgical operation room. These Post-operative contaminations cannot be excluded. These research studies only concentrated to evaluate the quantity of microbial load for the serialization procedure [5,6]. Glutaraldehyde: Glutaraldehyde most frequently used chemical disinfectant primarily used for heat sensitive instruments. It is considered to be a potent bactericidal, virucidal and fungicidal activity. 2 to 3.2% glutaraldehyde (neutral or alkaline) can disinfect instruments in 10 to 30 minutes depending upon their formulation. Mechanism of its action is based on its interaction with the amino groups in proteins and enzymes. In dentistry, generally 2% Glutaraldehyde is normally used, which is sufficient to achieve a sporicidal effect [7,8]. Hydrogen peroxide (H2O2): Hydrogen peroxide has been shown to be effective against all forms of microorganisms, including dormant forms with very high resistance such as bacterial spores and protozoal cysts, and also infectious proteins such as prions depending on the specific use of the chemical . It also has advantages with regard to its toxicity and environmental profile. However, overall, the effective and safe use of hydrogen peroxide depends on the way it is used, in particular the concentration. Hydrogen peroxide is available in the concentration ranging from 3% to 90%. It is considered to be environmental friendly as it rapidly degrades into harmless products i.e. water and oxygen. Hydrogen peroxide have strong oxidizing properties as it produce hydrogen free radicals, which further attack the cell components like protein , DNA and lipids [7-9]. Alcohol: Alcohols are effective disinfectants to be used in disinfection of diagnostic dental instruments. Mechanism of action of alcohol is dissolution of lipids, which make them very effective against lipid associated members of viral cells like HIV and Hepatitis. They lack the capability to penetrate protein rich material, that why alcohols are categorized under intermediate level disinfectant. The antimicrobial activity of alcohols is optimum in the range of 60-99.9%, but it becomes significantly lower at concentrations below 50%. After surgical procedure, the surgical instruments should be cleaned as soon as possible. As with the early cleaning of instruments, there will be limited growth of the microorganisms and the sterility of the instruments can be achieved very accurately and early. However, the delay in the cleaning process after the surgical use of the instruments, involves the faster growth of the microorganisms and chances of cross infection will be there even after the serialization [10-12]. Limited data has been published in this regard. With this in mind, we evaluated the direct relationship between bacterial load on contaminated stainless steel surgical instruments and the holding time prior to disinfection and also evaluate the disinfecting efficacy of 2% glutaraldehyde, 6% hydrogen peroxide (H2O2) and 99.9% ethyl alcohol on contaminated diagnostic dental instruments”. Ethical clearance was obtained from the institutional ethical board as well as from Institutional Research Board before starting the study. A total of 120 pairs of surgical instruments were collected and evaluated for the study. Out of the 120 pair, 60 pairs of the tissue forceps and 60 pairs of the DeBakey forceps were evaluated in this study. Tissue forceps was used to hold the superficial skin and DeBakey forces were used to hold the internal structures like organs or inner membranes. The major surgical procedures that were done in the time period between the May 2016 to September 2016 were included in the study group. The surgical procedure involved was 24 gastrotectomy, 20 hepatectomy, 18 pancreatoduodenectomy, 15 colectomy, 12 abdominal aortic operation and 11 plastic reconstructive surgeries. Procedure to evaluate the number of microorganisms on the stainless steel surgical instrument: The stainless steel used instruments in the above mentioned surgeries were evaluated to calculate the average number of micro-organism per square centimeter. Two different methods have been used for the evaluation of microorganisms on two different forceps. Tissue forceps were first of all collected after the major surgical procedures. Immediately after the collection of forceps, the instruments were immersed in the 100 ml of the phopspohate saline with 0.05% of polysorbate. The mixture was then poured into the sterile polythene container. The container was then shaken thoroughly at the rate of 150 rpm for the next 25 minutes. After that, 50 ml of the solution was sampled and pass through the 0.5 mm thin membrane filter. Then collected filtered then placed on the tripticase soy agar plates. The plates were cultured at temperature of 32°C for 2 to 4 days. The number CFU were then finally evaluated and analysed. In the 2nd method, cotton swabs immersed in saline and then scrubbed on the DeBakey forceps. The collected cotton swabs were then immersed further in 1 ml of physiological saline. After the vortexing, 100 μL of the solution were spread on the sheep blood agar. The plates of sheap blood agar were then incubated at temperature of 37°C for next 24 h. Then the number of colonies was counted. Evaluation of the association between the time of holding and the average microbial load on contaminated instruments: The four different inocula were prepared in the two different medium. The inocula of 5 × 103 CFU/ml of Staphylococcus aureus, Pseudomonas aeruginosa and E. coli were prepared on the sheep blood agar and the inocula of Bacillus subtilis and their spores were prepared on the tripticase soy agar plates. All the four strains i.e. Staphylococcus aureus, Pseudomonas aeruginosa, E. coli and Bacillus subtilis were used to contaminate the sterilize stainless steel pieces. For recovery of microorganisms staphylococcus aureus, Pseudomonas aeruginosa and E. coli, the contaminated pieces were incubated in the petri dishes at the 37°C for 2 h, 4 h, 6 h, 8 h,12 h, 24 h, 36 h and 48 h. After the completion of incubation, the contaminated pieces were then immersed in the saline. Then the solution of 100 μl was incubated on the blood sheep agar. Number of the CFU were evaluated and analysed. Then the CFUs had been compared with time zero after the incubation. Numbers of colonies were assessed on the basis of time-kill kinetic assay. The test was continuously repeated for three times at the every incubation time and further, median microbe count of the three were evaluated. In 2nd method, 20 ml of the spore solution of B. subtilis was dropped onto the forceps. Then it was dehydrated for the next 40 minutes and kept in the separate trays. Then 80 ml of the phosphate saline with 0.05 % polysorbate was added. Material was then shaken for the next 25 minutes at the speed of 150 rpm. Then the 1 ml further incubated on tripticase soy agar at the temperature of 30°C for next 48 h. The total number of CFU was then evaluated. Around 2 × 103 CFU of B. subtilis were recovered from the surface of forceps. Adenosine triphosphate assay: The quantity of present Adenosine triphosphate was also measured on contaminated instruments to evaluate the gross contamination of the surgical instrument. The collected prepared sample of 100 ml was put directly on the ATP assay kit. ATP level of different surgical instruments by using luminometer in the Relative Light Units (RLU). Evaluation of efficacy of different disinfecting solution: We have also evaluated the efficacy of different disinfecting or the cleaning solution in disinfecting the surgical instruments with the autoclaving taken as the gold standard. The surgical instruments were disinfected with following disinfectants. • Group 1: Distilled water. • Group 2: 2% Glutaraldehyde solution. • Group 3: 6% H2O2 solution. • Group 4: 99.9% ethyl alcohol. The pre-disinfection count of microorganisms were calculated and compared with post disinfection microbial count in each and every group. The mean reduction in the microbial count following disinfection was also compared between different disinfectant groups. Later, the instruments were taken back and disinfected using a designated disinfectant for 30 min. The post-disinfection stock solution was prepared using the methodology described earlier. The stock solution was diluted further to obtain 10-2 and 10-3 serial dilutions. To elicit the growth of microorganisms, nutrient agar was taken as a medium. Pour plate technique was employed to uniformly dispense the diluted samples on the petri plates containing the nutrient agar. These Petri plates were then inoculated and incubated at 37°C for 24 h. The total numbers of Colony Forming Units (CFU’s) of the viable microorganisms on the petri plates were counted and comparison was made between pre disinfection and post disinfection solution of different disinfectants. The CFU’s were counted by using digital colony counter. As the study design was double blinded, so all the subjects of the study and lab assistant who carried out this microbiological assay were not aware of about the type of instruments used and the disinfectant. Results showed that the DeBakey forceps showed statistically significant higher rate of positive culture than the tissue forceps with p value of less than 0.05. The results showed that the bacterial load varies according to the procedure used (Table 1). The bacterial load varies from the 0 to 300 CFU/cm2. The rate of the positive culture or the bacterial load was highest in the surgery of gastrotectomy followed by pancreatoduodenectomy. In the gastrotectomy the bacteria load was 3 × 102 followed by pancreatoduodenectom, the count was 2.8 × 102. The different surgical procedures show different level of positive culture of the microorganisms but there was no significant difference among the surgical procedure regarding the bacteria load (Table 2). Table 1. Microbial contamination of surgical instruments according to type instrument. Table 2. The count of CFU of micro-organism on surgical instrument. Then we have established the correlation of bacterial load and holding time. The analysis showed strange results. In the first 6 h, the bacterial load did not showed any changes. It was absolutely the same as it was before the 6 h. However, after the passage of 6 h, the bacterial load started increasing suddenly. We have found the logarithmic-ally increase of 3 log10 CFU/cm2 after the 12 h. The load continuously increasing in number till the 48 h (Table 3). Table 3. The Count of CFU of the microorganisms changes with the passage of time. The ATP level of the different surgical instruments was also measured. The mean level of ATP came out to be 3677 RLU units with the lowest limit of 9 RLU to upper limit of 4779 RLU. The RLU value of tissue forceps and DeBakey forceps among the various surgical procedures shows non-significant results. The correlation coefficient in regard to level of ATP was found to be non-significant i.e. 0.14. Those instruments that have residual ATP level below the 100 RLU considered to have less contamination ratio. Table 4. Comparison of the pre and post disinfection microbial contamination using different disinfecting solutions at 10-2 serial dilutions. Table 5. Comparison of the pre and post disinfection microbial contamination using different disinfecting solutions at 10-3 serial dilutions. When comparison of pre and post disinfection microbial contamination was done by using different disinfecting solutions at 10-2, dilution, the results showed that there was defiantly reduction in the Total Viable Count (CFU’s) following the disinfection compared to baseline levels. The reduction was noted in all the three disinfectants as well as with distilled water (Figure 1). The t value of distilled water at 10-2 dilution was 1.721 with p value of 0.200, t value of gluteraldehyde was 13.921 with p value of 0.005, t value of H2O2 was 14.256 with p value of 0.004, t value of ethyl alcohol was 4.291 with p value of 0.06. The total t value of all disinfectant at 10-2 dilution was 5.228 with p value of 0.001 (Table 4). However, a statistically significant reduction in the total viable count was observed following disinfection with glutaraldehyde (P: 0.005) and H2O2 (P: 0.004) (Figure 1). The reduction following disinfection with Ethyl alcohol (P: 0.060) and distilled water (P: 0.205) was not statistically significant. When comparison of pre and post disinfection microbial contamination was done by using different disinfecting solutions at 10-3 dilution, the results showed that there was also reduction in the total viable count (CFU’s) following the disinfection compared to baseline levels. The reduction was noted in all the three disinfectants as well as with distilled water (Table 5 and Figure 2). The t value of distilled water at 10-3 dilution was 1.996 with p value of 0.151, t value of gluteraldehyde was 5.902 with p value of 0.04, t value of H2O2 was 7.021 with p value of 0.02, and the value of ethyl alcohol was 5.247 with p value of 0.042. The total t value of all disinfectant at 10-3 dilution was 5.225 with p value of 0.001 (Figure 2). However, a statistically significant reduction in the total viable count was observed following disinfection with Glutaraldehyde (P: 0.04), H2O2 (P: 0.004) and with ethyl alcohol (P: 0.042) (Table 5). The reduction with distilled water was not statistically significant (P: 0.151). 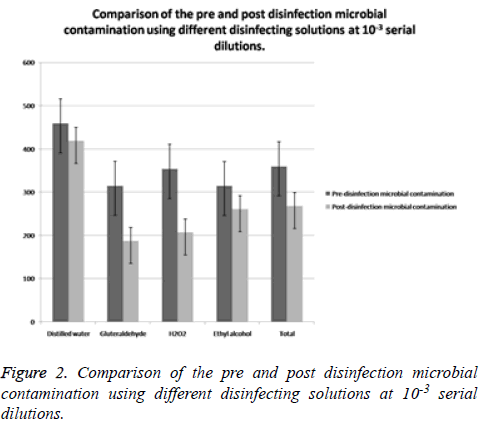 Figure 1: Comparison of the pre and post disinfection microbial contamination using different disinfecting solutions at 10-2 serial dilutions. Figure 2: Comparison of the pre and post disinfection microbial contamination using different disinfecting solutions at 10-3 serial dilutions. The mean reduction in the total viable count following disinfection at 10-2 dilutions was significantly higher in the groups involving the use of chemical disinfectants compared with distilled water with the P value of 0.040 (Table 6 and Figure 3). After that, Post hoc comparison was done between all the disinfectant groups. The results of post hoc analysis revealed a significant difference between the distilled water and H2O2 group with a p-value of 0.030 (Table 7). However, the posthoc comparison revealed no statistically significant difference between the other disinfectant groups at 10-2 serial dilution (Table 7). 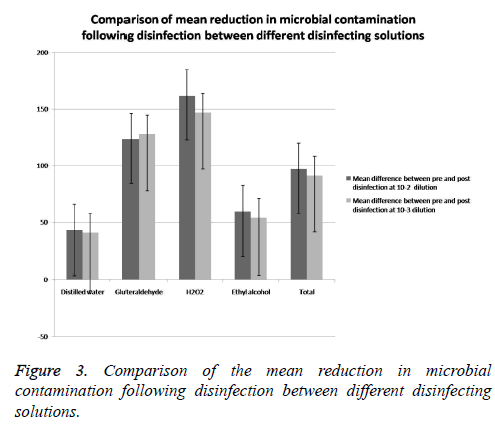 Figure 3: Comparison of the mean reduction in microbial contamination following disinfection between different disinfecting solutions. Table 6. Comparison of mean reduction in microbial contamination following disinfection between different disinfecting solutions. Table 7. Post Hoc analysis at 10-2 serial dilution. The mean reduction in the total viable count following disinfection at 10-3 dilution was significantly higher in the groups involving the use of chemical disinfectants compared with distilled water (P: 0.020). The results of post hoc analysis revealed a significant difference between the distilled water and H2O2 group with a p value of 0.040 (Table 8). However, the post-hoc comparison revealed no statistically significant difference between the other disinfectant groups at 10-3 serial dilution (Table 8). Table 8. Post Hoc analysis at 10-3 serial dilution. The results of the study showed those instruments are frequently contaminated during the surgical procedure. The bacterial load of the instruments depends on the location of the surgical procedure. Our study revealed that the highest level of microbial load was depicted in the gastrotectomy. Chan et al. conclude that the microbial load per device was related to the location where the device has been use . The authors suggested that microbial contamination on used dental hand pieces varied between 42 and 250 CFU/ml . The results of our study showed the microbial load on the instruments varies from the 0 to 300 CFU/cm2 depending upon the anatomical site of the surgery. Though the statistical analysis showed nonsignificant results regarding the anatomical site. In contradiction to our results, Nancy et al. found that bioburden levels varied between 0 and 4415 CFU per instrument after clinical use. Eighty eight percent of the instruments had bioburden levels lower than 1000. They have concluded that the bioburden level per instrument is dependent on the anatomic site where the device was used . The observation of the study also revealed that surgical stainless steel instruments not only contaminated through the direct contact but also through the indirect contact. In general surgical procedures, tissue forceps has no direct contact with the specific concerned organs because the instrument has been selected by the surgeon as according to the specific need in the operation. Tissues forceps basically used for dealing with the skin, However the DeBakey forceps having the direct contact with organs . Weber et al. also concluded that there is bidirectional trans- mission of microbes between hands and inanimate objects . Four different phases of the bacterial growth curve described in literature (Figure 4) that includes the lag phase, log phase, stationary phase and death phase. Lag phase: In this phase, the growth of bacteria's are very slow at initial, then the bacteria acclimatize to the conditions and the nutrients in the media. It is also known as initial stationary phase. This phase starts immediately after the inoculation and extends upto 2-3 h. Log phase: Once acclimatized, the bacteria begin to divide rapidly at an exponential rate, doubling every 10-20 minutes. Phase is characterized by exponentially very high rate of growth of the bacterial organisms over time. It is also known as exponential phase. This phase usually starts after the 4 h of the incubation and remains for further 4 h. Duration of log phase based on concentration of the nutrients, pH and the temperature. Stationary phase: The increasing numbers of bacteria begin to compete for the dwindling nutrients and their exponential growth is inhibited. The number of bacteria stabilizes. This condition may last for hours or days, depending on the nature of the bacteria. Death phase: As due to depreciation of the nutrients and increase rate of toxic products leads to the unhealthy and inappropriate environment for the microbes to grow and finally they started to dice (Figure 4) . Figure 4: Exponential growth of micro-organism with the passage of time. The current study revealed that the first or the lag phase was extended upto the 6 h. Then, the exponential phase start and last for the next 18 h. Next phase starts was the stationary phase. The stationary phase in our study was last for 48 h. In our study the death phase has not been achieved. The results of the study clearly indicate that this is important to reduce the microbial load on the contaminated instrument before the microorganisms starts growing. So, the time to achieve the serialization will be more in the cases where there are more number of microorganisms on the instruments as compared to the instruments that are having the less number of microorganisms. So, the instrument should clean with the disinfectant as soon as possible after the surgery and before the serialization procedure to achieve the more accurate results which further will reduce the cross contamination. Lipscomb et al. concluded that the cleaning standards at the time of testing were in need of improvement. Although no evidence of microbial or endotoxin contamination was found, the extent to which there is proteinaceous and nonproteinaceous soiling must be of concern and has been linked with serious complications that may arise when instruments, even if sterile, are left within a patient. Either new operating procedures must be instigated, although increasing wash time within an SSD is not ideal, or new cleaning chemistries must be developed and validated. In addition, the application of presoak solutions which can both clean and maintain an instrument's wetness immediately after operative use may produce a reduction in the contaminants that an SSD is required to remove . To ensure protection against cross infection, the most effective procedure is sterilization of the instruments. It is a procedure that ensures total destruction of all living organisms, including viruses and spores. Disinfection, on the other hand is an intermediate method used to reduce the number of pathogens through chemical agents. Proper protocol should be followed for Decontamination and sterilization of reusable instruments to ensure the limit of spread of microorganisms (Figure 5). 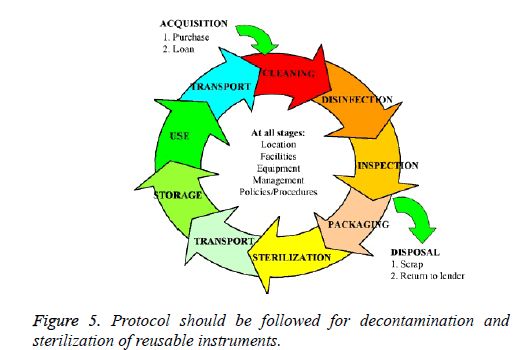 Figure 5: Protocol should be followed for decontamination and sterilization of reusable instruments. Jokar et al. conducted the study and compared the efficacy of alcohol isopropyl and ethanol in reducing contamination of medical diagnostic devices. Our study followed the same protocol, except that we have taken three different disinfectants with distilled water as negative control and we have estimated the total viable count instead of qualitatively assessing the positive cultures . In our study, the maximum reduction in microbial load was observed with the disinfection of H2O2 at 10-2 and at 10-3 dilution. The Descending order of disinfection at 10-2 and 10-3 was observed in our study as followed: H2O2>Glutaraldehyde>Ethyl Alcohol>Distilled water. Linger et al. conducted a study to know the effectiveness of H2O2 in dental unit waterlines and they have concluded that an easy-to-use hydrogen peroxide-based dental unit waterlines disinfectant demonstrated effectiveness in improving the quality of water used for intraoral procedures . So, the results of this study are quite in consistent with our study. Stephen et al. conducted a study with the aim, to compare the time difference, safety, and sonographers’ satisfaction between the glutaraldehyde and the hydrogen peroxide on Vaginal Ultrasound Probes. They also conclude that hydrogen peroxide based disinfection system was proven to be more efficient and safer to use than the glutaraldehyde based disinfection. In our study, we also have concluded that hydrogen peroxide is more effective than gluteraldehyde . Badrian et al. in their study investigated the effect of three different types of disinfecting agents on circular samples of alginate impression material which were deliberately contaminated. Among all the three disinfectants used, hydrogen peroxide based disinfectant showed the highest reduction and was successful in completely eradicating all the tested microorganisms within 10 min. These results were in contrast to the results of our study where although Hydrogen peroxide showed maximum reduction, it could not completely eliminate viable microorganisms. The difference is mainly due to that in this study, selected microorganisms were tested in this study while we evaluated the total viable count without emphasizing on specific strains . There are some limitations in our study. First of all, we did not follow the postoperative clinical course of the study patients because we only focused on intraoperative contamination of forceps. The population of patients in the present study was too small to discuss the relation between microbial load rate and the contamination of surgical instruments. Another limitation of our study is that not all the microbes on surgical instruments, including biofilm-forming microbes, might have been recovered. More types and greater numbers of microbes might be recovered using other recovery methods or culture conditions such as longer culture times. After the research, we reached the conclusion that there should be mandatory to clean the surgical stainless steel instruments during the first 6 hours after the surgery, so that the accurate and effective serialization of instrument can be achieved. We have also concluded that with the use of chemical disinfectants there is reduction in total viable count of microorganisms. But, none of the disinfectant is able to remove 100% of the microorganisms. So, defiantly there will be some chances of cross infection even after the disinfection with the chemical disinfectants as even a minute percentage of microorganisms can cause cross infection. The study favors the recommendation of using sterilized instruments rather than just relying on chemical disinfectant. Rutala WA, Weber DJ. Disinfection and sterilization in health care facilities: what clinicians need to know. Clin Infect Dis 2004; 39: 702-709. Ganavadiya R, Chandra Shekar BR, Saxena V, Tomar P, Gupta R, Khandelwal G. Disinfecting efficacy of three chemical disinfectants on contaminated diagnostic instruments: A randomized trial. J Basic Clin Pharma 2014; 5: 98-104. Spaulding EH. Principles of microbiology as applied to operating room nursing. AORN 1963; 1: 49-45. Chu NS, Chan-Myers H, Ghazanfari N, Antonoplos P. Levels of naturally occurring microorganisms on surgical instruments after clinical use and after washing. Am J Infect Control 1999; 27: 315-319. Rutala WA, Gergen MF, Jones JF, Weber DJ. Levels of microbial contamination on surgical instruments. Am J Infect Control 1998; 26: 143-145. Chan-Myers H, McAlister D, Antonoplos P. Natural bioburden levels detected on rigid lumened medical devices before and after cleaning. Am J Infect Control 1997; 25: 471-476. McDonnell G, Russell AD. Antiseptics and disinfectants: activity, action, and resistance. Clin Microbiol Rev 1999; 12: 147-179. Vinay P, Reddy GY, Hegde N, Priyadarshini. Sterilization methods in orthodontics-a review. Int J Dent Clin 2011; 3: 44. Abdullah S. Sterilization-an update. Pak Oral Dent J 2009; 29. Instrument Preparation Working Group. Proper maintenance of instruments. Revised Germany Instrument Preparation Working Group 2005. Huys J. Sterilization of medical supplies by steam. Germany Benedict Press 2004; 1. Saito Y. Microbial contamination of surgical instruments used for laparotomy. Am J Infect Control 2013; 1-5. Smith G, Smith A, Ramage G. Assessment of biofouling of dental handpieces after use. Abstract Book of 10th World Congress of Sterilization Crete Greece 2009; 9. Gerhardts A, Hammer TR, Balluff C, Mucha H, Hoefer D. A model of the transmission of microorganisms in a public setting and its correlation to pathogen infection risks. J Appl Microbiol 2012; 112: 614-621. Weber DJ, Rutala WA, Miller MB, Huslage K, Sickbert-Bennett E. Role of hospital surfaces in the transmission of emerging health care-associated pathogens: norovirus, Clostridium difficile, and Acinetobacter species. Am J Infect Control 2010; 38: 25-33. Perkins JJ. Growth and death of microorganisms. Principles Methods Steril Health Sci 1969; 56-62. Lipscomb IP, Sihota AK, Keevil CW. Comparative study of surgical instruments from sterile-service departments for presence of residual gram-negative endotoxin and proteinaceous deposits. J Clin Microbiol 2006; 44: 3728-3733. Jokar A, Mohebbi Z. Comparing the efficacy of alcohol isopropyl and ethanol on the reduction of contamination of medical check-up devices in children ward and neonatal intensive care unit (NICU). Int Res J Pharm Pharmacol 2011; 1: 75. Linger JB, Molinari JA, Forbes WC, Farthing CF, Winget WJ. Evaluation of a hydrogen peroxide disinfectant for dental unit waterlines. J Am Dent Assoc 2001; 132: 1287-1291. Johnson S, Proctor M, Bluth E, Smetherman D, Baumgarten K. Evaluation of a hydrogen peroxide-based system for high-level disinfection of vaginal ultrasound probes. J Ultrasound Med 2013; 32: 1799-1804. Badrian H, Ghasemi E, Khalighinejad N, Hosseini N. The effect of three different disinfection materials on alginate impression by spray method. ISRN Dent 2012; 2012: 695151.